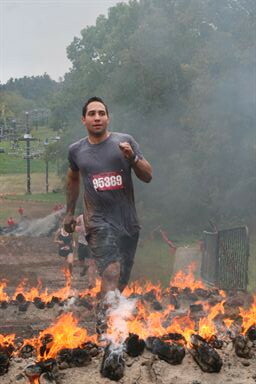 This past Sunday I completed the Warrior Dash 5k Race. 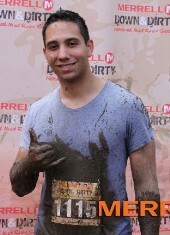 This is the second mud run I have completed, the first being the Spartan Race last month. This race was significantly more difficult. It took place on Windham Mountain in Windham, NY. My completion time was 58 minutes and 43 seconds. Considering the fastest male completed the entire course in 21 minutes I was a bit on the slow side, though I couldn't even begin to imagine completing the race that fast and I'm in pretty good shape. I was literally gassed out after the first few minutes. Most of the race was uphill and my right knee started giving me trouble when we started going down hill. I was actually extremely surprised about the knee. Normally I only have issues with it if I run for an extended period of time on cement. Considering this was all trail running on a ski mountain I didn't think there would be an issue but apparently descending at a steep decline poses a problem for me. This race made me realize that I am a long way off for being prepared for the 12 mile race in November. I need to get very serious about training to be remotely near being capable of completing the Tough Mudder race.